Jemsite > Guitars and Gear > All Other Guitars (including Prestige) > Which locking tuners will fit an RG 421? Which locking tuners will fit an RG 421? Hey all, I'm looking to replace the tuners on my '17 RG 421, since they are a little clunky to use, so I figured I may as well got some locking tuners if I'm going to spend the money (for ease of string changes). Anyone know from experience which brands will fit without modification, if any? I really don't want to have to drill a hole in the neck for a set screw. I've heard Carvin/Kiesel tuners are direct fit but I can't find any solid info on this, anyone have any ideas? Got a picture of your current tuners? If the quality MIJ gotoh ones (10mm hole with 45-degree set screw) then Gotoh locking tuners for sure fit. Also 99.9% certain D'Addario Planet Waves Auto Trim are direct swap (Ibanez has used these with their logo). Re: Which locking tuners will fit an RG 421? OK, I wouldn't get hung up on the set screws. What i would do i if it were my axe is remove a tuning peg and first measure the diameter of the hole/opening. If it's 10mm then get one of the ones (or others) linked. The small set screw adds literally 1-2 minutes to the install. I'm just a little worried that I'll mess it up somehow and drill the hole too deep or in the wrong place lol. I'm sure it can't be too difficult, I'm just paranoid. I generally check and tighten the tuning machines whenever I change strings. Mostly I've been having problems keeping it in tune the past couple months, and they aren't the smoothest tuning machines. The ones on my Strat are real easy to use, but these ones can be finicky, and I often go past the pitch I'm trying to get to. It's not super crucial, but given that it's a hard tail I feel it could stay in tune a little better; plus I love how easy locking tuners are when changing strings. there is no reason to be fearful of the install, it's rather fool proof. 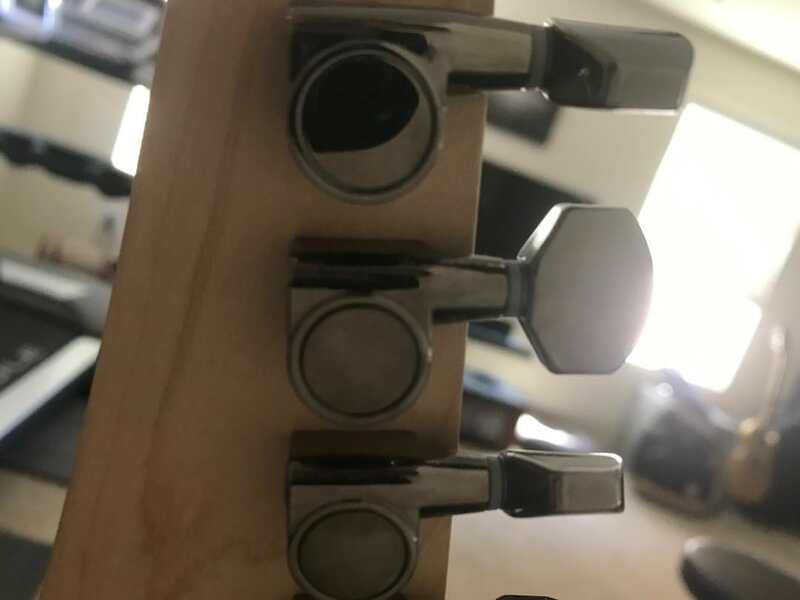 Once the tuner is tight from above and aligned you can simply use a small finishing nail (or equivalent screw) to indent the wood to get started then just screw in the set screw in. Thanks, I have the gotoh tuning machines on the way! Just be wary of the screws, they are made of very soft metal. Get a drill bit a little smaller than the diameter of the thread on them, mark the depth with some tape, so you don't overshoot and risk going through the headstock. Just put the screw against the bit and mark off with the tape where the head starts. Drill the pilot holes and then be very careful screwing them in. It's still very easy to round out the head. They'll twist in half trying to put them in a hole too small. Thanks for the help guys, install went super smooth. Ended up tightening them on with the nut on the front of the head stock and using a very thin awl to make the pilot holes, then just careful screwed them in by hand with a #0 phillips. Easier than I thought it would be! Guitar stays perfectly in tune even with brand new strings, which is perfect. Problem solved.